Kitty, a 9-year old kid, was brought by her mother to the park one summer afternoon to play. Kitty had a wonderful time playing with lots of kids. A week later, she experienced high fever. Four days after, her mother noticed reddish spots on Kitty’s neck which she keeps on scratching. A trip to the pediatric clinic revealed that Kitty has measles. Measles is an acute viral respiratory illness. 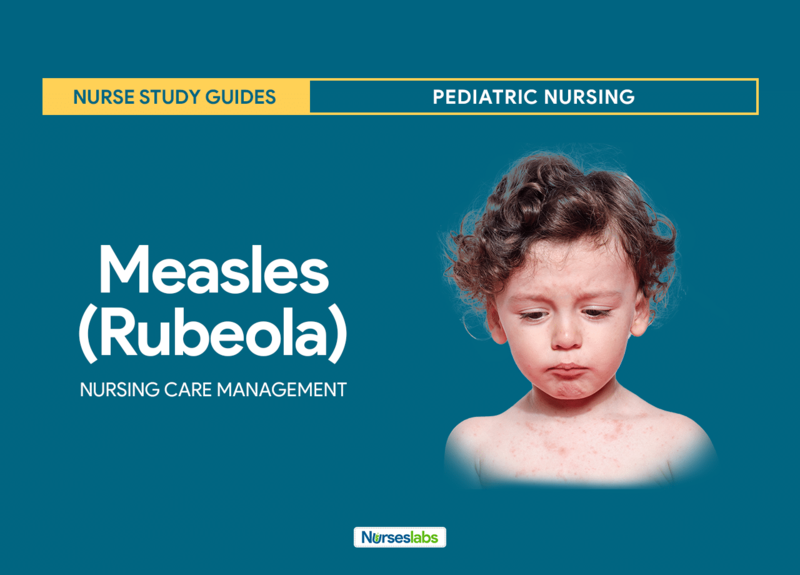 Measles, also known as rubeola, is one of the most contagious infectious diseases, with at least a 90% secondary infection rate in susceptible domestic contacts. Despite being considered primarily a childhood illness, measles can affect people of all ages. Measles is marked by prodromal fever, cough, coryza, conjunctivitis, and pathognomonic enanthem (ie, Koplik spots), followed by an erythematous maculopapular rash on the third to seventh day. In temperate areas, the peak incidence of infection occurs during late winter and spring. Infection is transmitted via respiratory droplets, which can remain active and contagious, either airborne or on surfaces, for up to 2 hours. Initial infection and viral replication occur locally in tracheal and bronchial epithelial cells. After 2-4 days, measles virus infects local lymphatic tissues, perhaps carried by pulmonary macrophages. Following the amplification of measles virus in regional lymph nodes, a predominantly cell-associated viremia disseminates the virus to various organs prior to the appearance of a rash. Measles virus infection causes a generalized immunosuppression marked by decreases in delayed-type hypersensitivity, interleukin (IL)-12 production and antigen-specific lymphoproliferative responses that persist for weeks to months after the acute infection. The practice of administering 2 doses of live-attenuated measles vaccine to children to prevent school outbreaks of measles was implemented when the vaccine was first licensed in 1963. The immunization program resulted in a decrease of more than 99% in reported incidence. From 1989 to 1991, a major resurgence occurred, affecting primarily unvaccinated preschoolers; this measles resurgence resulted in 55,000 cases and 130 deaths and prompted the recommendation that the second dose of measles vaccine be given to preschoolers in a mass vaccination campaign that led to the effective elimination in the United States of endemic transmission of the measles virus. By 1997-1999, the incidence of measles had been reduced to a historic low (< 0.5 cases per million persons). From 1997 to 2004, the reported incidence was as low as 37-116 cases per year. From 2000 through 2007, an average of 63 cases was reported annually to the US Centers for Disease Control and Prevention (CDC). In 2004, 34 cases were reported; after that all-time low, however, the annual incidence began to increase, with most cases linked either directly or indirectly to international travel. In 2005, 66 cases of measles were reported to the CDC. Of these, 34 were linked to a single outbreak in Indiana associated with the return of an unvaccinated 17-year-old American traveling in Romania. In 2006, a total of 49 confirmed cases were reported in the United States. From January to June 2008, 131 cases of measles were reported to the CDC. At least 47% of the 131 measles infections were in school-aged children whose parents chose not to have them vaccinated. In the period from January 1 to May 20, 2011, a total of 118 cases were reported to the CDC; this represents the highest reported number of measles cases for the same period since 1996. Of the 118 cases, 105 (89%) were associated with importation; the source of the remaining 13 cases could not be ascertained. In all, 105 (89%) of the 118 patients were unvaccinated; 24 (20%) were persons 12 months to 19 years of age whose parents claimed a religious or personal exemption. Approximately half of the 118 cases—58, or 49%—were accounted for by 9 outbreaks. The largest of these outbreaks involved 21 persons in Minnesota, in a setting where parental concerns about the safety of measles, mumps, and rubella (MMR) vaccine caused many children to go unvaccinated. As a result of this outbreak, many persons were exposed, and at least 7 infants too young to receive MMR vaccine were infected. From January 1 to May 23, 2014, 288 confirmed cases were reported to the CDC, a figure that exceeds the highest reported annual total number of cases (220 cases in 2011) since measles was declared eliminated in the United States in 2000. In developing countries, measles affects 30 million children a year and causes 1 million deaths. Measles causes 15,000-60,000 cases of blindness per year. In 1998, the cases of measles per 100,000 total population reported to the WHO was 1.6 in the Americas, 8.2 in Europe, 11.1 in the Eastern Mediterranean region, 4.2 in South East Asia, 5.0 in the Western Pacific region, and 61.7 in Africa. In 2006, only 187 confirmed cases were reported in the Western Hemisphere (mainly in Venezuela, Mexico, and the United States). Between 2000 and 2008, the number of worldwide measles cases reported to the WHO and the United Nations Children’s Fund (UNICEF) declined by 67% (from 852,937 to 278,358). Of the 66 cases of measles reported in the United States in 2005, 7 (10.6%) involved infants, 4 (6.1%) involved children aged 1-4 years, 33 (50%) involved persons aged 5-19 years, 7 (10.6%) involved adults aged 20-34 years, and 15 (22.7%) involved adults older than 35 years. Among the 118 US patients reported to have measles between January 1 and May 20, 2011, age ranged from 3 months to 68 years. The cause of measles is the measles virus, a single-stranded, negative-sense enveloped RNA virus of the genus Morbillivirus within the family Paramyxoviridae. Host. Humans are the natural hosts of the virus; no animal reservoirs are known to exist. Mode of transmission. This highly contagious virus is spread by coughing and sneezing via close personal contact or direct contact with secretions. Immunodeficiency. Children with immunodeficiency due to HIV or AIDS, leukemia, alkylating agents, or corticosteroid therapy, regardless of immunization status, are likely to contract measles. Environment. Travel to areas where measles is endemic or contact with travelers to endemic areas could cause measles. Absence of antibodies. Infants who lose passive antibody before the age of routine immunization easily contracts measles. The incubation period from exposure to onset of measles symptoms ranges from 7 to 14 days (average, 10-12 days). High fever. The first sign of measles is usually a high fever (often >104o F [40o C]) that typically lasts 4-7 days. Prodromal phase symptoms. This prodromal phase is marked by malaise, fever, anorexia, and the classic triad of conjunctivitis, cough, and coryza (the “3 Cs”). Exanthem. The characteristic exanthem generally appears 2-4 days after the onset of the prodrome and lasts 3-5 days; the exanthem usually appears 1-2 days after the appearance of Koplik spots; mild pruritus may be associated, on average, the rash develops about 14 days after exposure, starting on the face and upper neck (see the image below) and spreading to the extremities. Koplik’s spots. Small spots (Koplik spots) can be seen inside the cheeks during this early stage. Although the diagnosis of measles is usually determined from the classic clinical picture, laboratory identification and confirmation of the diagnosis are necessary for the purposes of public health and outbreak control. Antibody assays. The measles virus sandwich-capture IgM antibody assay, offered through many local health departments and through the CDC, is the quickest method of confirming acute measles; laboratories can confirm measles by demonstrating more than a 4-fold rise in IgG antibodies between acute and convalescent sera, although relying solely on rising IgG titers for the diagnosis delays treatment considerably. Viral culture. Throat swabs and nasal swabs can be sent on viral transport medium or a viral culturette swab to isolate the measles virus; urine specimens can be sent in a sterile container for viral culture. Reverse-transcription polymerase chain reaction (PCR). Reverse-transcription polymerase chain reaction (PCR) evaluation is highly sensitive at visualizing measles virus RNA in blood, throat, nasopharyngeal, or urine specimens and, where available, can be used to rapidly confirm the diagnosis of measles. Chest radiography. If bacterial pneumonia is suspected, perform chest radiography; the frequent occurrence of measles pneumonia, even in uncomplicated cases, limits the predictive value of chest radiography for bacterial bronchopneumonia. Treatment of measles is essentially supportive care. Hydration. Maintenance of good hydration and replacement of fluids lost through diarrhea or emesis is a primary concern. Vitamin A supplementation. Vitamin A supplementation, especially in children and patients with clinical signs of vitamin A deficiency, should be considered. Hospitalization. Hospitalization may be indicated for the treatment of measles complications (eg, bacterial superinfection, pneumonia, dehydration, croup). Antibiotic therapy. Secondary infections (eg, otitis media or bacterial pneumonia) should be treated with antibiotics; patients with severe complicating infections (eg, encephalomyelitis) should be admitted for observation and antibiotics, as appropriate to their clinical condition. Postexposure prophylaxis. Prevention or modification of measles in exposed susceptible individuals involves the administration of measles virus vaccine or human immunoglobulin (Ig). Medications used in the treatment or prevention of measles include vitamin A, antivirals (eg, ribavirin), measles virus vaccine, and human immunoglobulin (Ig). Vitamin A. Vitamin A treatment for children with measles in developing countries has been associated with a marked reduction in morbidity and mortality; thus, two doses of vitamin A given 24 hours apart are recommended; a third age-specific dose should be given 2 to 4 weeks later to children with clinical signs and symptoms of vitamin A deficiency. Antivirals. Measles virus is susceptible to ribavirin in vitro; although ribavirin (either IV or aerosolized) has been used to treat severely affected and immunocompromised adults with acute measles or SSPE (IV plus intrathecal high-dose interferon alfa), no controlled trials have been conducted; ribavirin is not approved by the US Food and Drug Administration (FDA) for this indication, and such use should be considered experimental. Vaccines. The live MMR vaccine is used to induce active immunity against viruses that cause measles, mumps, and rubella. Immunoglobulins. Human Ig prevents or modifies measles in susceptible individuals if administered within 6 days of exposure. The nurse caring for the child should be aware of the proper procedure to be done and how to handle the patient. Physical exam. Assess the child for symptoms that may indicate the presence of measles. Knowledge of the disease. Assess the patient’s or significant other’s knowledge regarding the disease. Hygienic practices. Assess the family’s hygienic practices to prevent the spread of the disease. Impaired social interaction related to isolation from friends. Risk for impaired skin integrity related to raking pruritus. High risk of infection related to the host and infectious agents. Acute pain related to skin lesions and irritated mucous membranes. Skin will stay clean, dry and intact. Mucous membranes will stay moist, discomfort will stay within defined tolerable range by patient. Patient will understand purpose of isolation, cooperate and be free of distress. Isolation. Patients will need to be on isolation precautions to decrease transmission within the community; emphasize the need for immediate isolation when early catarrhal symptoms appear. Skin care. Measles causes extreme pruritus; nursing interventions include keeping the patient’s nails short, encourage long pants and sleeves to prevent scratching, keeping skin moist with health care provider recommended lotions, and avoiding sunlight and heat. Eye care. Treat conjunctivitis with warm saline when removing eye secretions and encourage patient not to rub eyes; protect the eyes from the glare of strong light. Hydration. Encourage oral hydration; medical literature encourages the use of oral rehydration solution. Temperature control. Antipyretics should be administered to the patient as ordered for a temperature greater than 100.4 Fahrenheit unless directed elsewise by a healthcare provider; be sure to remind parents not to administer aspirin due to the risk of Reye’s syndrome. Skin became clean, dry and intact. Mucous membranes stayed moist, discomfort will stay within defined tolerable range by the patient. Patient understood the purpose of isolation, cooperate and be free of distress. You are the charge nurse on the pediatric unit when a pediatrician calls wanting to admit a child with rubeola (measles). Which of these factors is of most concern in determining whether to admit the child to your unit? There are several children receiving chemotherapy on the unit. The infection control nurse liaison is not on the unit today. No negative-airflow rooms are available on the unit. Clients with rubeola require implementation of airborne precautions, which include placement in a negative airflow room, this child cannot be admitted to the pediatric unit.Options A, B, C: The other circumstances may require actions such as staff reassignments but would not prevent the admission of a client with rubeola. A child age 7 was unable to receive the measles, mumps, and rubella (MMR) vaccine at the recommended scheduled time. When would the nurse expect to administer MMR vaccine? In a month from now. In a year from now. Based on the recommendations of the American Academy of Family Physicians and the American Academy of Pediatrics, the MMR vaccine should be given at the age of 10 if the child did not receive it between the ages of 4 to 6 years as recommended. Immunization for diphtheria and tetanus is required at age 13. A 6-year-old child is scheduled to have measles, mumps, and rubella (MMR) vaccine. Which of the following route will you expect the nurse to administer the vaccine? Intramuscularly in the vastus lateralis muscle. Intramuscularly in the deltoid muscle. Subcutaneously in the gluteal area. Subcutaneously in the outer aspect of the upper arm. (MMR) the vaccine is administered subcutaneously in the outer aspect of the upper arm.Options A and B: MMR is not administered intramuscularly. Option C: Gluteal area is not used as a site. A nurse is preparing to administer a Rubella vaccine to a client prior discharge home. Which of the following is not true regarding this vaccine? Pain, redness, swelling, or a lump is some of the adverse reaction. The need to use of contraception after immunization. Contraindicated in a client with an allergy to duck eggs. Rubella Vaccine is administered subcutaneously prior hospital discharge to a nonimmune postpartum client.Option A: Common side effects on the injection site. Option C: The client should avoid pregnancy for 1 to 3 months after immunization with rubella vaccine. Option D: The possible presence of egg protein in the vaccine. A nonimmunized child appears at the clinic with a visible rash. Which of the following observations indicates the child may have rubeola (measles)? Small blue-white spots are visible on the oral mucosa. The rash begins on the trunk and spreads outward. The lesions have a “teardrop on a rose petal” appearance. Koplik’s spots are small blue-white spots visible on the oral mucosa and are characteristic of measles infection.Option B: The body rash typically begins on the face and travels downward. Option C: High fever is often present. Option D: “Tear drop on a rose petal” refers to the lesions found in varicella (chicken pox). Text Mode: All questions and answers are given on a single page for reading and answering at your own pace. Be sure to grab a pen and paper to write down your answers. 1. You are the charge nurse on the pediatric unit when a pediatrician calls wanting to admit a child with rubeola (measles). Which of these factors is of most concern in determining whether to admit the child to your unit? A. There are several children receiving chemotherapy on the unit. B. The infection control nurse liaison is not on the unit today. C. The infection control nurse liaison is not on the unit today. D. No negative-airflow rooms are available on the unit. 1. Answer: D. No negative-airflow rooms are available on the unit. Clients with rubeola require implementation of airborne precautions, which include placement in a negative airflow room, this child cannot be admitted to the pediatric unit. Options A, B, C: The other circumstances may require actions such as staff reassignments but would not prevent the admission of a client with rubeola. 2. A child age 7 was unable to receive the measles, mumps, and rubella (MMR) vaccine at the recommended scheduled time. When would the nurse expect to administer MMR vaccine? A. In a month from now. B. In a year from now. 2. Answer: C. At age 10. 3. A 6-year-old child is scheduled to have measles, mumps, and rubella (MMR) vaccine. Which of the following route will you expect the nurse to administer the vaccine? A. Intramuscularly in the vastus lateralis muscle. B. Intramuscularly in the deltoid muscle. C. Subcutaneously in the gluteal area. D. Subcutaneously in the outer aspect of the upper arm. 3. Answer: D. Subcutaneously in the outer aspect of the upper arm. (MMR) the vaccine is administered subcutaneously in the outer aspect of the upper arm. Options A and B: MMR is not administered intramuscularly. Option C: Gluteal area is not used as a site. 4. A nurse is preparing to administer a Rubella vaccine to a client prior discharge home. Which of the following is not true regarding this vaccine? A. Pain, redness, swelling, or a lump is some of the adverse reaction. C. The need to use of contraception after immunization. D. Contraindicated in a client with an allergy to duck eggs. 4. Answer B. Given intramuscularly in the lateral aspect of the middle third of the vastus lateralis muscle. Rubella Vaccine is administered subcutaneously prior hospital discharge to a nonimmune postpartum client. Option A: Common side effects on the injection site. Option C: The client should avoid pregnancy for 1 to 3 months after immunization with rubella vaccine. Option D: The possible presence of egg protein in the vaccine. 5. A nonimmunized child appears at the clinic with a visible rash. Which of the following observations indicates the child may have rubeola (measles)? D. The lesions have a “teardrop on a rose petal” appearance. 5. Answer: A. Small blue-white spots are visible on the oral mucosa. Koplik’s spots are small blue-white spots visible on the oral mucosa and are characteristic of measles infection. Option B: The body rash typically begins on the face and travels downward. Option C: High fever is often present. Option D: “Tear drop on a rose petal” refers to the lesions found in varicella (chicken pox).